This inflatable Monster Truck Combo will make your next party or event a huge success. This unique inflatable bounce house features a large bouncing area, a climb and a slide. This eye catching Bounce house is 18' high, 13' wide and 33' long, and requires 2 blowers. This bouncer requires a completely flat setup area. The inflatable is 18 feet high, please make sure that the setup area is free of power lanes above. This monster truck bouncer is really heavy, and if you are setting on a fenced yard, make sure that there is access to drive a pick up truck inside the yard. WE WILL NOT GO TO HILLS OR STEPS WITH THIS UNIT ON A DOLLIE OR HANDTRUCK. If you are setting in grass, please find out if you have pipes of any kind running under the setup area. We will not deliver or setup this unit if the chance of rain is higher than 40%, or the wind is blowing 15 MPH or more. 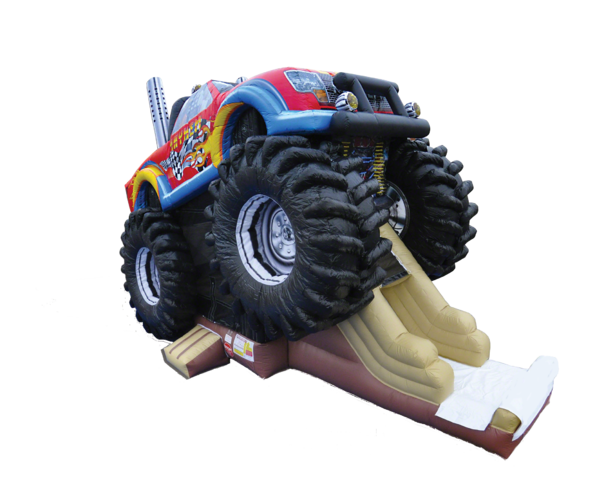 To complement the monster truck combo bounce house, we offer concession machine rentals, as well as tables and chairs, obstacle courses and interactive games. DO YOU WANT TO SEE HOW BIG THIS MONSTER TRUCK BOUNCE HOUSE IS? TAKE A LOOK AT THIS VIDEO!